The theme of this e-book is that the truth will set you free. Do you know the 10 major magic myths that may be holding you back? 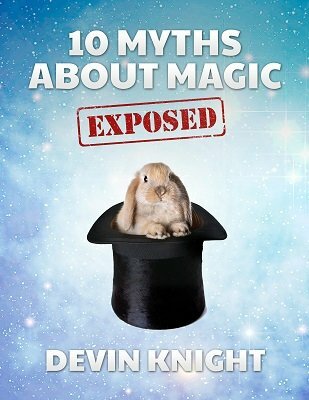 In this e-book, the author exposes the biggest myths about magic that many magicians still believe. He then gives you the REAL facts. This information is an eye-opener for both new and experienced magicians. It was derived from more than thirty years performing experience and from discussions with other professional magicians. Real world "in the trenches" information assembled for you in one easy to read e-book. Does magic really make you more popular? Do people really enjoy being fooled? How does the public really feel about magic? Are there bad audiences, or just bad magicians? Does practice really make perfect? Is magic really as much fun as you think it is? You will learn the answers to these questions and much more in this e-book. This book also includes a special bonus section, "9 Lies That Some Magic Dealers Tell You To Make Sales." You will learn how to be a savvy magical consumer and not fall prey to these lies. The truths revealed in this insightful e-book may shock you, but you will go away enlighten with a better understanding of magic and its true impact on your audiences. You may not agree with everything the author has to say, but this book will make you think. It may change the way you think about magic. A must-read for any magician wanting to improve his understanding of magic. Every magician should read this information. To make it affordable, it has been priced exceedingly low. Do not let the low price fool you. This information is worth much more to any magician wanting to enhance his career in magic. 1st edition 2013, 17 pages. This is great! Every beginning magician should read this, and experienced magicians may find it a refreshing statement of truths we know but don't always talk about. I especially like the parts about the lie that everybody loves magic, and the lie that "practice makes perfect." A small price to pay for a large helping of truth.